i've partnered with gypsy skirt vintage to bring you an amazing giveaway! remember when i promised a giveaway once sewing in the past reached 150 followers...? well...here is the long awaited promise...and SO worth the wait. i'm in love with their crazy cool vintage clothing! the winner of this giveaway will receive a $30 gift certificate to gypsy skirt vintage!!! gypsy skirt vintage draws upon over three years of vintage selling experience to present you with lovely and unique hand selected vintage clothing and accessories ranging from the 1940s to the 1980s. giveaway will end sunday, june 19th at midnight. Well Rebecca, I'm the first (and very likely the last) guy to post about this contest :) I'd have to say that the paisley floral skirt is my favorite, though I probably won't be the one wearing it. My email address is xslim92@gmail.com. Oh, and I really like your blog! 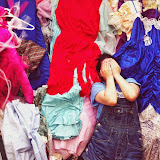 I already have gypsyskirtvintage in my favorites! I hearted it. . . I follow "Sewing in the Past". I do like the blue gingham maxi dress! Shop is already on my favorites! My favorite thing is the mod 60's house dress. I hearted my favorite dress. Aaaaaaaaaaaaaand, here is my contact info. Hooray for awesome giveaways!!!!! I hearted Gypsy Skirt Vintage. I hearted my favorite items.